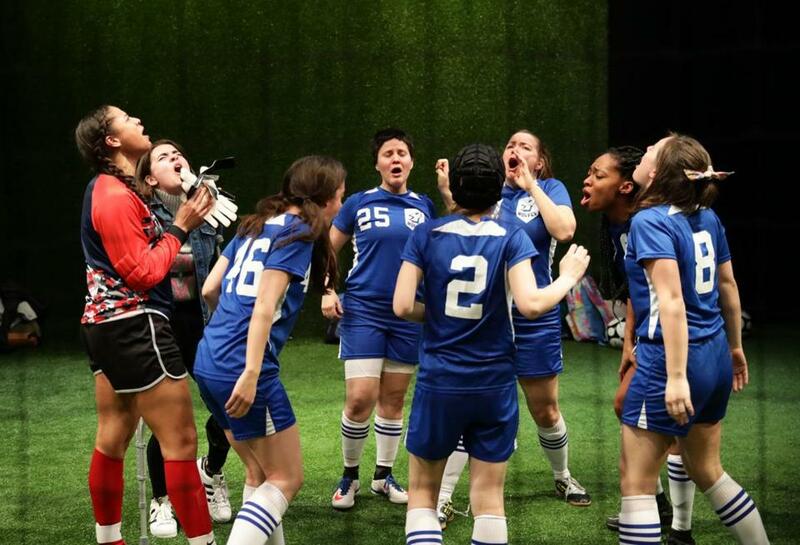 As they go through pregame warmup exercises in the opening moments of Sarah DeLappe’s “The Wolves’’ at Lyric Stage Company of Boston, the uniformed teenage girls gathered in a circle on an indoor soccer field never stop talking, not for a minute. Words burst out of them as if they are fearful a thought will disappear if it goes unspoken. Much of what the girls say sounds fragmentary and disconnected, topic-leaping from the genocidal Khmer Rouge to a Netflix documentary about snake-handling to the availability of Twitter in China, from whether their unseen coach is hung over to whether one girl’s menstrual pad will fall out during competition to recollections of a Las Vegas soccer showcase the girls had engaged in a year earlier. DeLappe’s uncanny grasp of the everything-at-once pace of adolescence and the hectic rhythms of teen-speak comes through in A. Nora Long’s first-rate Lyric Stage production of “The Wolves’’ — and so, crucially, does the playwright’s understanding of the social and psychological underpinnings of all that seemingly aimless talk. These soccer players are not just making conversation as they bat around opinions and ideas and apparently random observations, often while kicking balls to one another on the green turf of Shelley Barish’s netting-enclosed set. They are also trying on personae while taking steps toward figuring out the world, and their place in that world. Their gestating sense of self will become even more important by the end of “The Wolves,’’ when they have to grow up in a heart-wrenching hurry. Remarkably, “The Wolves’’ was DeLappe’s first play, opening off-Broadway in 2016 and becoming a Pulitzer Prize finalist in 2017. The play’s acute insight into the crucible of adolescence and the way a team can function as a kind of surrogate family reminds me of a nonfiction piece from two decades ago, also about young female athletes: “Life’s Swell,’’ Susan Orlean’s magazine profile of “surfer girls’’ in Maui. Adolescence is a time in our lives when the perceptions of others matter more than they ever will again. Director Long and her cast do an uncommonly skillful job in capturing the self-consciousness, alternating with bravado, of the soccer players. “The Wolves’’ is the quintessential ensemble piece. No cast member dominates the spotlight, and the nine actresses who play the girls at Lyric Stage rise admirably to the challenge of creating a group portrait while also differentiating themselves in a play that identifies characters only by number, not by name. The splendid ensemble includes Sarah Elizabeth Bedard (seen at Lyric Stage in 2017’s “Barbecue’’) as a cerebral, introspective midfielder, and Lydia Barnett-Mulligan (known for her work with Actors’ Shakespeare Project) as an insecure new girl who lives with her quirky mother in a yurt — which another girl refers to as a “yogurt.” Rounding out the young cast are Valerie Terranova, Jarielle Whitney, Chelsea Evered, Olivia Z. Cote, Grace Experience, Julia Lennon, and Simone Black. A soccer mom played by Laura Latreille is the only adult to make an appearance in “The Wolves,’’ very late in the play, and it’s a memorable one. But the last words belong to the girls, as they should, spoken in unison, which is fitting. And those words — in a final testament to the subtle, steadily accumulating power of this wonderful play — manage to simultaneously break and lift your heart.